The Youth Activity Profile (YAP) is an online version of an established self-report instrument designed to facilitate the assessment of physical activity in youth. The YAP captures time spent in physical activity both at school (e.g. before school, walking to school, in recess, in PE and during lunch) as well as at home (e.g. on the way home, at home, in the evening and on the weekends). It also captures time spent in sedentary pursuits such as TV, video games, computer and texting). In addition to capturing behaviors, the online YAP has been expanded to capture key psychosocial correlates of physical activity. These items can help teachers monitor children's attitudes and perceptions of physical activity - precursors to behavior change. Collectively, the YAP tool provides a comprehensive view of the child's physical activity patterns and behaviors. The YAP is currently being used in the NFL Play 60 Partnership to monitor youth PA behaviors and it is also available to all Iowa FitnessGram® schools. Participating sites are provided with customized log-in information and detailed instructions and support to assist in their use within their program. The YAP provides users with a detailed report about their activity patterns at school and at home. The data from the tool can be aggregated to provide summary reports for participating schools showing the distribution of physical activity profiles within their school. ​A unique feature of the YAP is that we have conducted calibration research that enables us to accurately estimate the time children spend in physical activity (min/week) as well as the time they spend in sedentary behaviors. This has been done by having children wear activity monitors to provide accurate data on physical activity. We are able to calbrate the subjective estimates to the more accurate objective estimates to allow time spent in PA and sedentary behavior to be estimated. The values provide good group level estimates of age and gender patterns but additional calibration work is being done to tighten up the relationships. You can learn more about this research on our lab webpage (www.physicalactivitylab.org). A summary of the YAP is available here. Feel free to also contact Dr. Greg Welk for details at gwelk@iastate.edu. 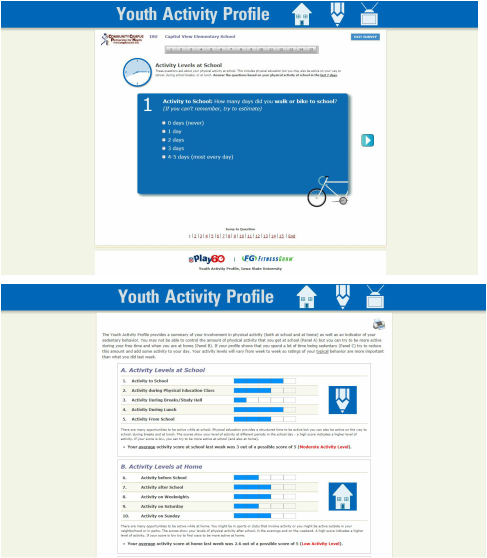 The Youth Activity Profile can be customized for use in your schools. We have developed methods to facilitate data collection at school as well as at home. Contact Dr. Greg Welk (gwelk@iastate.edu) to learn more about how to use this tool in your school. We would love to help you.